This section contains links to gun shops and specialist gun dealers located throughout England. We have been established since 1972. 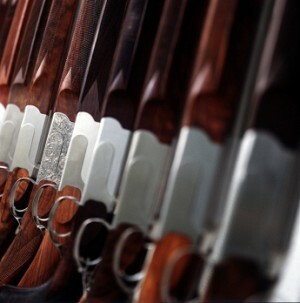 Our premises includes a shop stocking a large selection of sporting guns, ammunition and accessories, a workshop for woodworking and gun fitting and a second workshop containing specialist gunmaking machinery. The Sportsman Gun Centre offers a 'one stop shop' for the modern shooter, we supply shotguns, rifles, air guns, optics and accessories to both trade and retail customers. Main dealership for numerous top brands such as Beretta and Browning, we also sell secondhand guns including English side by sides and small bores. Large range of airguns. Patrick Keen has built up an enviable collection of quality guns including sidelocks, boxlocks, over & unders, hammer and wildfowling guns. The stock list is continually updated. Dealers in all types of air guns, rifles, sporting guns, country clothing and accessories. High quality gun smithing, repairs and restorations available on site. Stockists of new and used guns and all leading brands of accessories and ammunition, specialists in the repair and renovation of sporting shotguns. Bespoke guns built to order. New and seconhand shotguns and rifles, large range of quality clothing and shooting accessories including bags, lamps, decoys and camouflage nets. The company carries a vast stock including airguns, field target rifles, classic sporting guns, antique guns and a wide range of accessories for most shooting sports activities. Professional and friendly advice in a traditional country setting on all aspects of clay and game shooting, fishing and country clothing. Quality shotguns bought and sold.